After coming back from a hiatus, I checked the links on the sidebar of this website for relevance, and found that most linked sites no longer exists. In the time that I fell by the wayside, so did they. Attrition, chess blogs, like business enterprises, fall victim to its fatal effects. Maintaining a blog requires considerable attention, writing, editing, analyses, and graphic-making. Perhaps, a blog spewing chess gossip or paparazzi-style reports take less effort, but this website deals with the game itself. Bloggers lose interest, get tired, or sick, pursue other forms of self-expression, or outright stop existing. And then they go silently into the night. The links have been updated. They include the three chess-playing sites that have cultivate a substantial following-- Chess.com, lichess.com, and the Internet Chess Club. Between these three sites, you can have your fill of competition. When I am lagging in one, another site gives me a reprieve from, say, a 3-game losing streak. It is a conundrum. Don't ask me to explain. It has been a long time since my last post. A medical emergency needed to be addressed in 2014, plus a persistent condition of stasis ( laziness in common language ) are to blame. But, all is well now. For my next post, I present a situation in chess that occurs often in play. Greed plays a part in the game, and a player in a desperate situation may pin his hopes on his opponent's grabbing of material to get out of a bind. The position below, from one of my games played online, is a prime example. As you can see, Black was on the verge of checkmating White. In a last ditch effort, I played 21. Ba7+. All Black had to do was to sidestep the attack by not capturing the bishop. Capturing the bishop would only lead to further play by White. Mate on g2 was inevitable if Black played 21...Ka8. However, the game continued with 21... Ka7 22.Qa5+ Kb8 23. 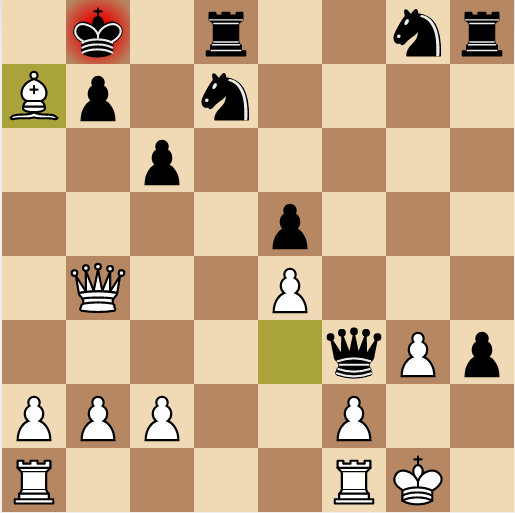 Qd8+ Ka7 24.Qa5+ and White achieved a perpetual check to save his game.